This story originally appeared onMarch 1, 2015. After World War II, the U.S. Navy found itself in uncertain waters, despite its enormous successes in the Pacific and Atlantic theaters. Blame the atomic bomb. The 1946 Operation Crossroads nuclear tests demonstrated naval power’s vulnerability to atomic attack. And the newly-independent U.S. Air Force claimed a near-monopoly over America’s nuclear weapons after the bombings of Hiroshima and Nagasaki. To stay relevant during the Cold War with the Soviet Union, the Navy needed new equipment and doctrine—and saw the future in naval aviation. Aircraft carriers came into their own as power-projection platforms during World War II. But in the late 1940s, no Navy plane could carry heavy, early-model atomic bombs—and no carrier could handle planes big enough to do so. 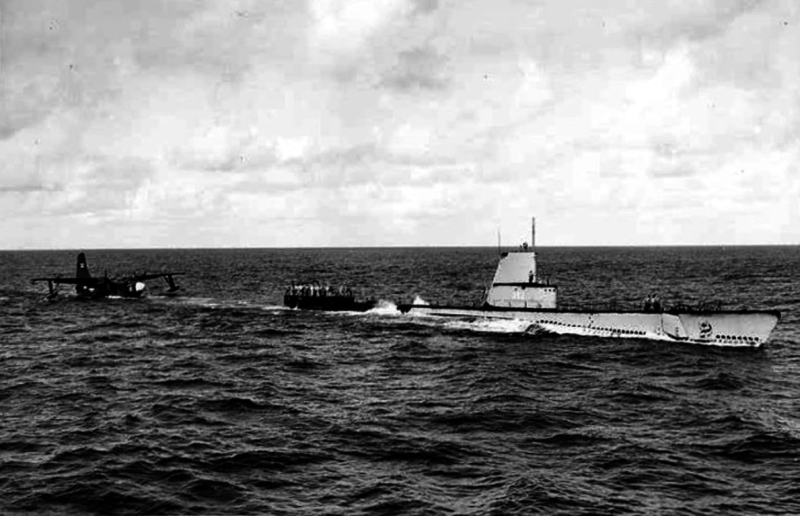 Throughout the 1950s, the Navy explored various technologies in an attempt to give the service an advantage in the nuclear era. Nuclear propulsion, sub-launched ballistic missiles and heavy attack aircraft eventually served the branch’s strategic niche. But the less-successful explorations created amazing machines—like tail-sitter planes and drone-launching subs—and three of the most advanced seaplanes ever built. Seaplanes fought hard and served well in transport, patrol and anti-submarine roles during World War II. 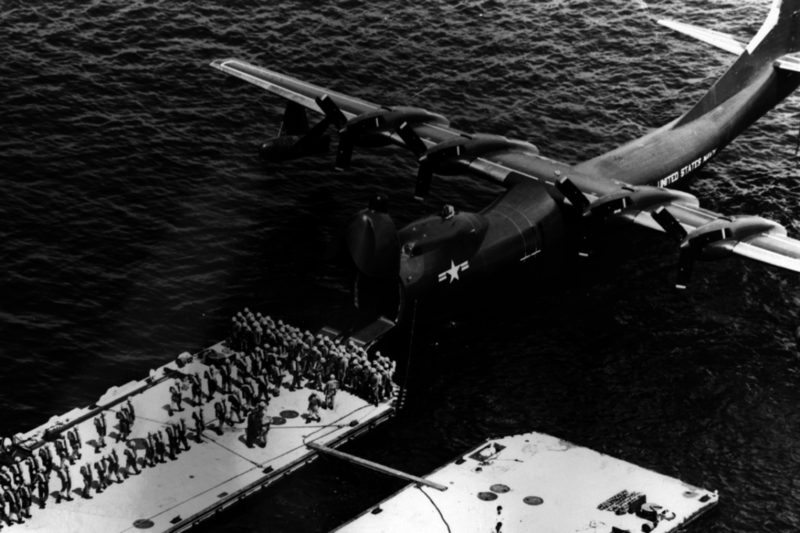 Their great advantage—the ability to use any reasonably calm body of water for a runway—proved essential in the Pacific. But during the war, big runways sprouted up all over the world to accommodate land-based fighters and bombers. The compromises required for an aircraft to perform well both in the air and on the water meant that land planes outperformed the seaplanes in speed and maneuverability. While searching to augment carrier power and counter arguments from land-based air power advocates, the Navy tried to create a Seaplane Striking Force. Which made a certain sort of sense. In the ocean, there’s no runways that could get bombed out of action. Necessary resources consisted of tanker submarines, docking ships and transport seaplanes. There was nothing stopping the bases from being as mobile as aircraft carriers. They might also cost a lot less. And wartime breakthroughs—thin aircraft hulls, delta wings, and jet engines—promised to revolutionize seaplane design. Along with German rocket technology, America had acquired new seaplane research and supersonic wing configurations. San Diego-based Convair, builder of the legendary PBY Catalina seaplane, incorporated the German work into their own seaplane studies. The first result was the XP5Y-1—a big, fast, flying boat powered by four twin turboprops spinning contra-rotating propellers. When it first flew in 1950, the XP5Y-1 matched the best wartime piston-powered fighters in performance. Designed as a heavily-armed anti-ship patrol bomber, the graceful aircraft sported a thin fuselage, a thin wing and a curved “cruiser” bow—all quite lengthy. As the Navy worked through its concept for a mobile, forward-based seaplane force, the XP5Y-1 developed into the R3Y Tradewind. The sailing branch envisioned the Tradewind playing a key role in supplying the seaplane force with air logistics and ship-based support. The Tradewind entered Navy service in 1954, replacing the giant Martin Mars seaplane on the California-Hawaii transport route. As a kind of flying-boat equivalent of Lockheed’s C-130 Hercules, the Tradewind further served as an aerial refueler and assault-troop transport. One Tradewind tanker refueled four Navy fighters at once, while another set a coast-to-coast seaplane speed record of 400 miles per hour. The modified R3Y-2 transport version replaced the graceful cruiser bow with a bulbous elevating front hatch. During exercises on San Clemente Island, Tradewinds taxied up to the beach and disgorged dozens of Marines and their equipment. But the exercise quashed the concept, as the big planes had trouble maneuvering up to the shore—and proved to be easy targets for shore fire. At the same time, Convair extensively studied the delta wing—a new, high-performance wing shaped like the letter V.
By 1951, the company had learned a lot from a previous jet-powered seaplane concept—the Skate—and began work on a supersonic seaplane with a delta wing design. This became the F2Y-1 Sea Dart. The Sea Dart combined a delta wing with jet power and a third revolutionary technology—the hydro-ski. A seaplane can stand upright on skis much like a human water skier, and Convair estimated that shock-absorbing struts could work like a person flexing their legs—and help take the rough ride out of takeoffs and landings. The Sea Dart first flew in April 1953. Its performance was really good for its day, comparable to the F-86 Sabre and F9F-8 Cougar fighter jets. Test pilots reported that the Sea Dart handled well in the water, and flew like a conventional jet fighter. During one test flight, the Sea Dart became the first seaplane to break Mach 1. Had it gone into operation, the sea fighter would have packed four 20-millimeter machine guns or 24 folding-fin missiles. With a combat range of only 500 miles, Sea Darts would have likely protected expeditionary forces and mobile bases. Their reach could have extended further with aerial refueling from Tradewind transports. And to be sure, Convair tested seabasing concepts for the Sea Dart, with taxiing exercises onto and off a converted landing ship. But these planes were insignificant compared to the Martin PGM-1 SeaMaster—photographed at top. 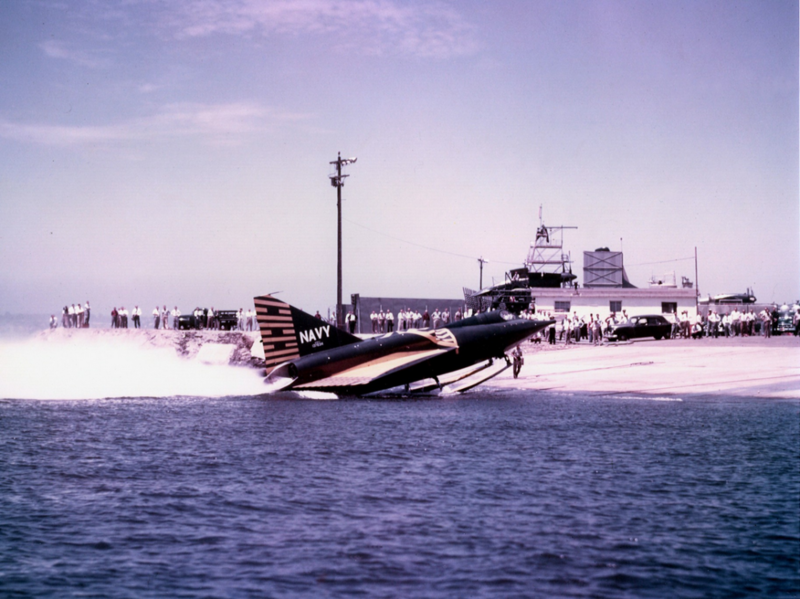 It was the fastest, most technologically advanced seaplane ever built by the United States. Debuting on Dec. 21, 1954, it combined everything then known about seaplane design into one huge, gorgeous swept-wing package. Like the Tradewind and the Sea Dart, the big, long-range bomber was a true flying boat in that it had no landing gear. The Sea Dart mounted small wheels on its skis and tail that allowed it to taxi up and down launching ramps. Powered by four turbojet engines, the SeaMaster could haul its 15-ton bomb load and four crewmembers through the stratosphere, or above the deck at more than 600 miles per hour. Though the Navy intended the plane to drop mines at high speeds, the SeaMaster could handle all of the sailing branch’s nuclear weapons. Its performance compared favorably with the B-52 Stratofortress as a strategic strike platform. Martin engineers cleverly designed the bomb bay—which had to awkwardly fit inside a boat bay—with a rotary system. When the plane released its payload, the bay rotated internally. Later prototypes fitted a refueling pod and drogue into the bomb bay, and they came equipped with cutting-edge navigation, radar and bombing electronics. And the Navy wanted the bomber to refuel at sea. The branch tested the submarine USS Guavina as a seaplane oiler. The tender ship USS Albemarle took on a huge, powered ramp to haul SeaMasters aboard for servicing. The Navy took delivery of five R3Y-1 and six R3Y-2 Tradewinds. But though the aircraft performed well, its engines seriously didn’t. In fact, the Allison T-40 turboprops—intended to provide high performance and fuel economy—proved outright dangerous. Several Tradewinds crashed or caught fire when engines seized up. Despite the big seaplanes’ grace and potential, the Navy pulled them form service and scrapped them all by 1958. The Sea Dart’s hydro-skis disappointed. Although the design promised high-speed water landings and takeoffs—and high performances when retracted during flight—they shook the plane hard. A fatal crash during a public airshow in 1954 didn’t help the Sea Dart’s case, either. No amount of testing or engineering—including swapping the twin hydro-skis for a single large one—could eliminate the vibrations. Faced with an expensive problem that wouldn’t go away, the Navy canceled the Sea Dart program in 1957. Advancements in carrier-launched jets helped kill the program, as well. But the most ambitious aircraft of the Seaplane Striking Force—the SeaMaster—had the worst problems. The SeaMaster’s afterburners scorched its fuselage, and the first prototype broke apart during a test flight in 1955 and killed its crew. Another prototype again killed its crew in a crash. After extensive and costly redesigns, the improved P6M-2 SeaMaster made good on its promise. But it was all too late. The Polaris submarine-launched ballistic program gave the Navy the strategic nuclear role it wanted, and super-carriers like the USS Forrestaland USS Enterprise gave the Navy the forward airbases it needed. The Navy’s initial order of 48 SeaMasters dropped to 24, then 18 … then 12 and finally eight. Contrary to the popular perception of bottomless post-war defense spending, the Pentagon was cutting costs and programs by the late 1950s. A high-tech, under-performing, over-budget project was ripe for cancellation. The Navy finished off the SeaMaster program in 1959. After spending more than $500 million—in 1950s money—on the Seaplane Striking Force, the concept sank out of sight. The military scrapped its remaining Tradewinds and SeaMasters, and only a few Sea Darts remain today as museum displays. But when the Navy first came up with the idea, the Striking Force wasn’t a harebrained scheme. It was a serious—and radically unconventional—solution to several serious problems. In 1950, seaplane design was leaping forward even as the Navy faced grave challenges to its purpose and identity. The same year, putting ballistic missiles on submarines capable of remaining submerged for months was outright science fiction. So much changed a decade later. But the legacy of the Seaplane Striking Force is more than just its awesomely cool aircraft. It’s a cautionary tale of technological change. Weapons systems today take even longer and cost far more than they did 60 years ago. It’s far more difficult to kill off weapons programs. But the same kind of inter-service rivalries that led to the jet-powered seaplanes still exist.